DIN rail is often used in industrial control applications as a common mounting system for a multitude of items, including power supplies, PLCs, breakout boards, screw terminals, and many other items. 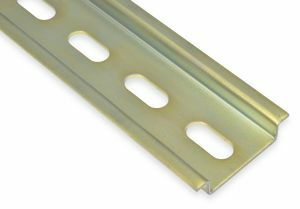 This DIN rail is the standard 35mm width by 7.5mm depth, which is the most common variety. Each piece is slotted ("perforated") to allow easy mounting to a panel. 100cm (1 meter): approx 39"